Boligan, and also Slovak cartoonists Rasťo Visokai, Bobo Pernecký, Miroslav Barvičák, Rado Repický. feeling is very important for young people, whom we have significantly addressed. A radio interview for the RTVS radio Regina was released on the 13th September in the morning. 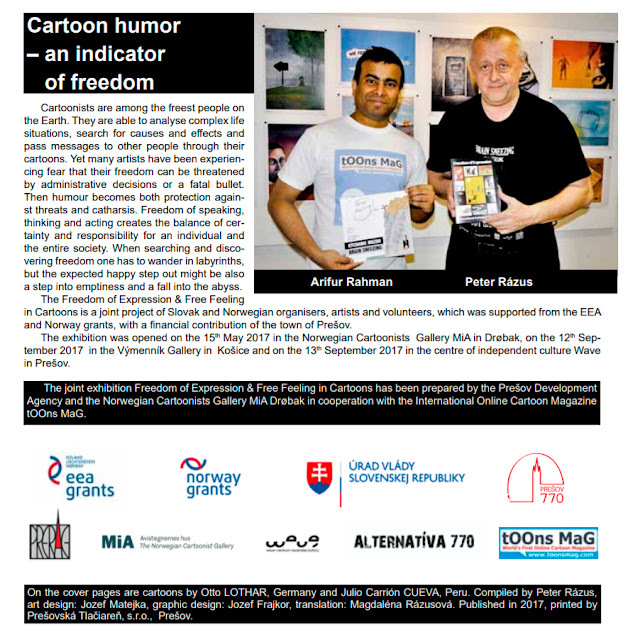 September 2017 in the programme “Ahoj Slovensko”. international competitions. 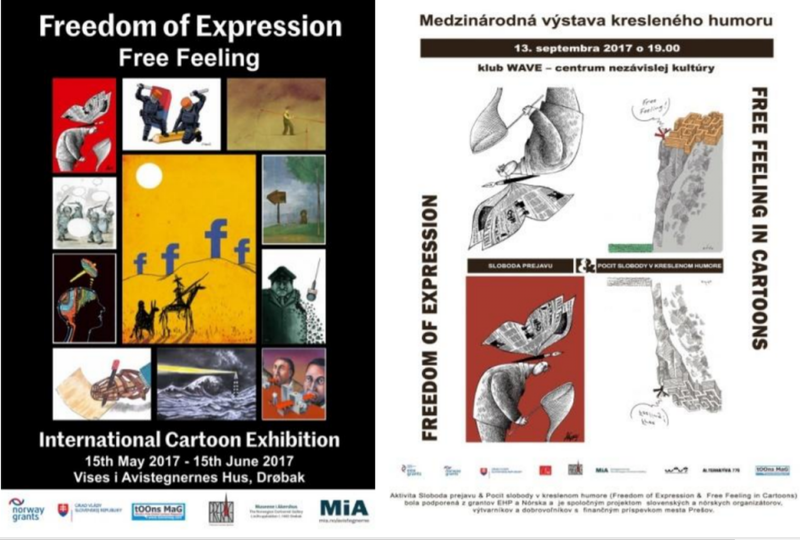 In Norway it was Freedom of Expression and in Slovakia Free Feeling. Altogether 120 cartoons were displayed. programme for the Slovaks living abroad. discussion then responded to the visitors´ questions about the project and Slovakia related issues. 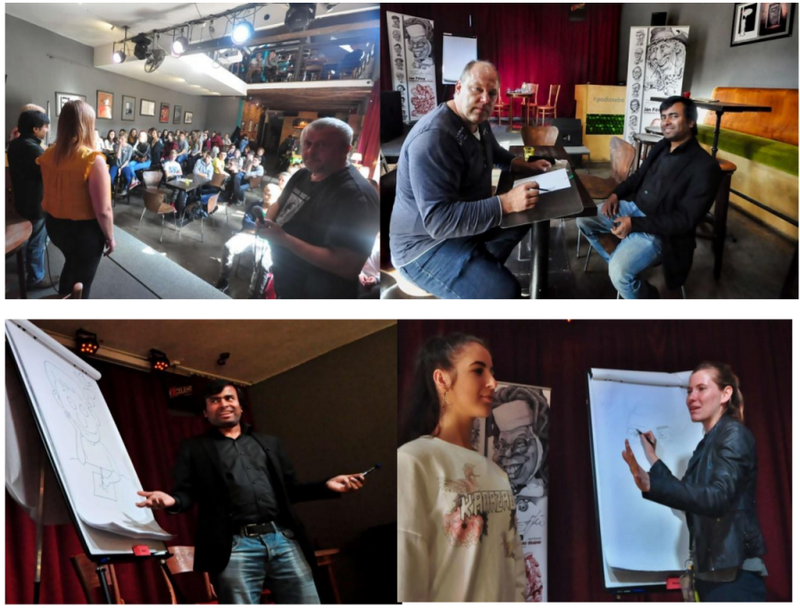 school children to the workshop, that was run by the cartoonists Rado Repický and Arifur Rahman. students participated in this activity. The Invitation to the workshop is enclosed in the attached files. cartoons as an important means of reflecting the current world. festival in Lillehammer and ways of using displayed cartoons for educational purposes, e.g. experience of Slovak partners with the cooperation with Presov University. quarter Grünerløkka, famous for its independent music clubs and galleries. presentation of Jan Fiťma, who showed how to draw a caricature. life of an artist in the country that has offered him a refuge. participants of the exhibition opening. young man who had to leave his own country because of his cartoons. The participants of the 3rd discussion forum mainly discussed the potential of further cooperation. in the discussion forums in Norway and Slovakia. organisational provision of activities in Drobak, mainly workshops for local schools pupils. Mrs.
media and presentation of the project in the media. project activities, writing and translating of the detailed final report. discussion forums and in media presentation of his experience with portraying. 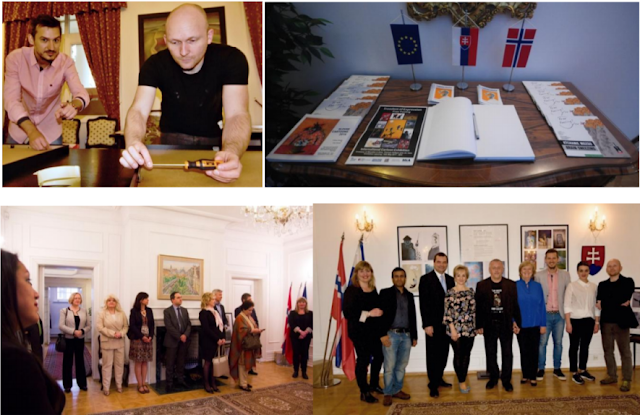 follow-up activities will be a regional manager of Norwegian-Slovak-Ukrainian cooperation.